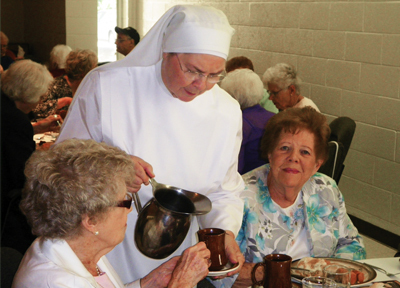 As Little Sisters of the Poor, we care for the elderly poor in the spirit of humble service we have received from our foundress, Saint Jeanne Jugan. We welcome the elderly as we would Jesus Christ himself and serve them with love and respect until God calls them home. We welcome low-income elderly (of at least 65 years of age) regardless of race or religion. We provide a welcoming “home-like” atmosphere. The best medical services are provided for all Residents by doctors, nurses, aides, physical therapists, a podiatrist, and a social worker. We also minister to our Residents emotionally and spiritually, making them happy and communicating to them the tenderness and mercy of God. 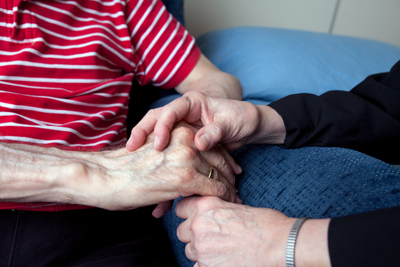 The compassionate care and accompaniment of the dying is the summit of our ministry. At Holy Family it is our goal that no one die alone. Residents have dining services on their floor. A dedicated kitchen staff prepares home-like dishes according to the tastes of the Residents. Our Residents enjoy an enriching activities program which includes arts and crafts, music therapy and musical entertainment, outings (including trips to their favorite dairy for homemade ice cream on a warm summer afternoon) and opportunities for socialization and intellectual stimulation. Located in the vicinity of several universities, we are the happy recipients of intergenerational activities between Residents and students. A weekly program with a day care center, provides additional interaction with smaller children for the Residents. We welcome the collaboration of many dedicated staff members, volunteers, and benefactors who are the extended hands and hearts of the Little Sisters.